MOTHERWELL FANS: WIN TWO TICKETS FOR MOTHERWELL V RANGERS THIS SUNDAY! Courtesy of Motherwell FC's new Health and Wellbeing partner Paycare, the Motherwell Times is offering one lucky 'Well fan the chance to win a pair of Davie Cooper Stand tickets for Sunday's exciting Motherwell v Rangers Scottish Premiership clash at Fir Park, kick-off 12.30pm. It promises to be an absolute cracker, with Motherwell having already earned a thrilling 3-3 draw against the Ibrox giants in this season's first Fir Park league encounter between the sides last August. To enter the competition, just visit the Motherwell Times and Speaker Facebook Page, hit Reply with your answer to the simple question below and (if you haven't already done so),'Like' the Facebook page. Also Share if you can. We'll draw the lucky competition winner around 12 noon tomorrow (Thursday). The winner should collect his or her prize from the Chapman Building in front of the Phil O'Donnell Stand before kick-off on match day. Good luck! 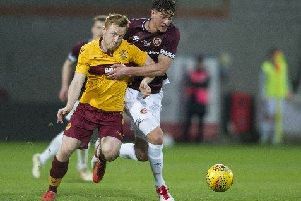 QUESTION: Can you name the no nonsense Motherwell defender (pictured) who scored a dramatic last gasp equaliser during the 3-3 Fir Park draw against Rangers last August?